When I was in school we used to have a textbook on fables and folk lore in English as a part of our syllabus (CBSE Board). Has anyone wondered why the male sparrow has black patch on the chest, throat and eyes? 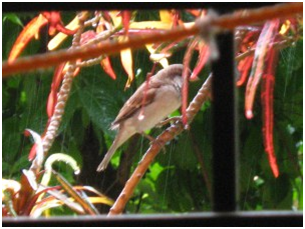 As I click the photos of the sparrow which I have uploaded in my album on Facebook, I recollect this story. According to a fable, when God created the sparrows both male and the female looked the same. They married and lived happily together. After sometime the female sparrow got pregnant and she laid the eggs after few months. The male sparrow would search for food and bring it to her. When the eggs hatched both the husband and wife were delighted to see their little babies. The wife said , “Dear, our children are so beautiful. I have a small wish. I want to apply kajal in my eyes so that when the babies open their eyes they should see how beautiful their mother is.” The male sparrow wanted to fulfill his lovely wife’s wish and searched all places for the kajal. But it was not available with anyone. In the evening when he was returning disheartened the koel asked him what was the matter. He explained his predicament to the Koel. The koel took some of the black from his body and applied it on the sparrow’s throat, neck and eyes. The sparrow thanked him and flew off to his nest. His wife quickly took some of the black and applied it in her eyes. The babies opened their eyes and the sparrows rejoiced. Later the sparrow went to wash off the black colour from his body but it didn’t go. It became permanent. That’s the reason the male sparrow has black patches while the female sparrow looks like it has applied kajal. Post has been published from the author’s blog with due permission from the author: VijayaLaxmi Narayanan. All images are a copyright of the author. This entry was tagged fable, god, koel, Sparrow, story. ← World Sparrow Day team Invites Volunteers this year! Every thing is possible in our world . If we have positive & creative mind .I know very well sparrows are vanacing due to environmental changes or modern life style i,e, use of mobile , modern houses having no facilities for sparrows & excess use of insectcides in our crops either to prevent or to grow high production.Sparrows are very small birds & they live in human houses .Only this bird makes its nest in our houses , but at present our houses are made by concrete and having no open space for them .